To get one of the best outdoor electric grills, you must read this whole article which will give you a list of best grills with features explanation as well pros & cons of each product. Additionally all your queries will get solved via in-depth buyer’s guide. Why an electric grill is desired over other outdoor grills? Choosing one of the top outdoor grill brands is difficult as most of them have the best features, so in that case you need to look into your needs & budget, that will help you make right choice and to further make sure you have the right electric grill, you can read reviews with pros & cons written by experts. Here are best outdoor electric grill reviews with pros & cons which you can read to know which grill suits your needs. George Foreman is a recognized name in electric grills for indoor and outdoor use. The 15-serving indoor-outdoor grill is a stylish model for your patio or balcony. It works great as an indoor unit as well, which you’ll appreciate if you live in an apartment and don’t want to set off the smoke detectors. The model is large enough to entertain with. Here’s a look at what the George Foreman indoor/outdoor electric grill has to offer. The grill is easy to set up. The stand is removable and needs to be attached to the bowl. The grilling plate is teflon coated and fits in the bowl. A generous lid goes on top to keep food hot for longer. Setting up the grill is quick. A temperature controller can be plugged in for use. The silver and black finish gives the grill an attractive appearance. It stands at 2 ½ feet with the stand. You can remove the stand and use the 6-inch high grilling bowl on your kitchen counter as well. The grill offers good heating action. It preheats in a few minutes and is ready to cook. The temperature controller offers five heat settings that are accurate, and range from warming temperatures to searing temperatures for steaks. The heating elements have been designed to allow as much even heating as is possible. The domed lid is large enough to cover a whole roast. It also has vents to help hot air circulate and cook food evenly. The cooking surface is quite large to make enough food for a large family and to entertain friends. 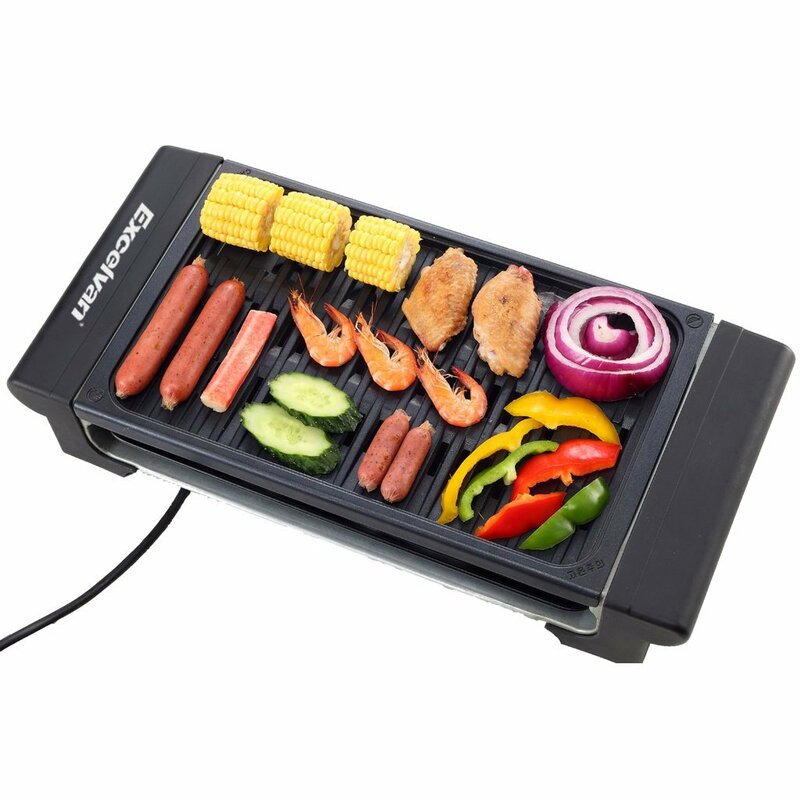 The grate is non-stick and lets you cook vegetables, meats and hamburgers without additional oil. There is a slight slope on the surface that drains oils through the channels into a drip tray placed under the grate. The George Foreman grill is easy to clean. You can simply remove the temperature control and wash the grease tray and the lid in the dishwasher. The grilling grate can be wiped with a damp paper towel after use. The plate cannot be immersed, but the top surface can be sponged and cleaned with cleaning sprays without too much trouble. The grill heats up efficiently and quickly in a few minutes. The cooking surface is large at 240 square inches. The pedestal may seem a little unstable with the top-heavy grill bowl on it. The cable may seem a little short without an extension. Overall, the George Foreman grill is among some of the best outdoor electric grills out there. As a bonus, it is also great for indoor use. You can use it with or without the stand. When there are energetic kids around, for instance, you may prefer not to use the stand and place the grill on the counter for safety. The large domed lid helps to cook up juicy steaks and meats without drying out the meat. You don’t need to add more than a dash of oil for the cooking surface, which means you can enjoy healthy barbecues with family and friends. Overall, the George Foreman electric grill can feed a large group of people without a lot of hassle on your part. If you enjoy barbecues on your patio but don’t want to smoke up the area, then you may prefer an electric grill like the Char-Broil TRU-Infrared patio grill. It is designed to look like it means business, and the price reflects this. The grill has a stable stand that would be hard to topple. It has a lid and an ergonomic handle, that you can open to reveal a large cooking area with an extra grate on the lid for additional cooking area. The unit has a rating of 4 out of 5 on Amazon, from 1299 reviews, and there’s a reason for its popularity. Let’s take a look at what makes the Char-Broil TRU-Infrared grill so popular. The Char-broil grill looks stylish and compact. There are wheels at the bottom of the sturdy base so that you can wheel the grill around the patio from the cooking area to the serving area. This is one of the largest outdoor electric grills you’re going to find at the moment. It has a large enough cooking surface to make food for four people. The company claims you can make as many as eight to twelve hamburgers, and it is possible, if you make them small enough and also use the extendible little tray on the lid. It is built to be compact, so you get about 240 square inches of grilling area. The reason you won’t get electric grills that are too large is that larger grills can be hard to make energy efficient. At 1750 watts of heating element, this grill gets reasonably hot without achieving the kinds of temperatures you get on a gas grill. As far as electric grills go, you’ll find the grill grate gets hot enough for searing. Don’t expect the intense charcoal grill flavor from this electric unit. But you can get a hint of smoky flavor from wood chips that can be placed in the grill for smoke. The grill design has focused on maximizing the heating efficiency of the electric elements. The grill has a special grate that protects the heating element from flare-ups, with a porcelain coating. The grate itself is built out of powder coated steel. Overall, this makes the grill grate a little flimsy. So users should be careful not to knock the grate over to prevent damage. The grill either arrives assembled, or it needs to be assembled. Assembly is not difficult, and the manual helps with clear instructions. The unit has a temperature gauge on the lid, which is a bonus that not many grills include. With the gauge, you can find out at a glance the temperature of the grill. The handle is cool-touch and stays cool while grilling. The storage grate is yet another bonus that lets you hang your tongs and other tools close while you cook. The unit weighs about 54 pounds, and the wheels make it easy to be maneuvered. Like other electric grills, the Char-broil uses infrared for heating. This is not a feature unique to this grill, but all electric grills. This is what sets electric grills apart from gas grills, that use hot air to cook. This fair tends to dry heat out. The Char-Broil instead uses infrared radiant heat that cooks without drying food out excessively. To enjoy a smoky flavor, you can put wood chips in a box that can be purchased from Char-Broil. Alternatively, you can put soaked wood chips in a tin foil basket before grilling. Wood chips can also be placed between the cooking grates, but not directly under greasy food for fear of flareups. As with most electric grills, if you want to maintain heat, it is important to keep the lid on. While preheating, keep the lid on until the grill reaches the desired temperature and then put on the food to be cooked. The grill does not heat evenly, and it is hard to find an electric grill that does. The grilling manual specifies which parts of the grilling surface gets hotter than others. Following the instructions will make it easier for more accurate cooking. The back of the grill close to the heating element can get very hot, so you can enjoy the flexibility of a slow cooking surface in front and a quick cooking surface at the back. Easy to assemble and easy to clean. Wiping after use is enough to keep the grill easier to clean and maintain. There is no need for excess cooking spray to be used. Achieves a good balance between price and quality of hardware and performance. Some users have complained about the time taken by the grill to heat up. Keeping the lid on can limit this problem to some extent. You may miss clamshell style grills when you have to flip over burgers and find that the food takes a little while to cook through. If you can’t have a charcoal or gas grill where you live, and you grill often enough, you may want to shell out the money for the stylish Char-Broil. The grill is compact enough to fit in apartment balconies as well. It is large enough to make food for a family of four. Overall, this is a well-made grill that is not too expensive, and delivers on all counts. Excelvan produces innovative consumer electronics. The Excelvan Portable 1120 W electric barbecue grill is an inexpensive as they come, which is an innovation in itself. For less than $40, you get a grill with adjustable temperature that goes up to searing levels, cool touch edges, a non-stick drip tray and 1 year warranty. There are few grills that can be used both outdoors and indoors, and this little grill is one. It is approved by the ETL. The question is, do you get what you pay for with the Excelvan Portable grill or does it outdo its price point in the true spirit of innovation? The grill offers practically smokeless grilling. You can cook up hamburgers and steaks, and as long as you fill the drip tray with water to the recommended level, there will be no smoke. The water catches the grease and prevents the drippings from smoking. This makes the grill great for outdoor and even indoor use. When using it indoors, make sure to fill drip tray and keep windows open. At this price point, it is difficult to find an electric grill that heats up hot enough to sear meats. The limitations of a 110 V power supply means that it can be difficult to get a grill hot enough. The Excelvan portable grill is quite good as far as heating is concerned. It doesn’t dry food out and heats reasonably high that you can cook hamburgers and steaks on it. The meat can take a little long to cook, however, when compared with traditional and some higher priced grills. The Excelvan grill is quite easy to clean. The grill grate lifts out of the unit and can be washed with soap and water. The grill element is carefully embedded in its die cast aluminum channels. This means that as long as you avoid the electrical contacts you can clean the plate with water. The drip pan also slides out and can be washed with soap and water. The die cast aluminum material means that the grill is lighter than cat iron, cheaper as well, and is going to last longer than some other grills around the same price point. This is an open-style grill that is great for cooking a variety of foods including hamburgers, steaks, and vegetables. The grill gives you the option to choose from several temperature settings. You can keep your food warm with the lowest temperature setting. You can cook up kebabs, chicken breasts, hamburgers and thinly sliced vegetables without using additional oil. The highest heat setting is for searing meats, and it achieves a reasonably high temperature for searing steaks. The grill grate is designed with plenty of vents for the food to cook evenly. A common problem with electrical grills is that they are difficult to heat evenly. On the Excelvan, the heating is reasonably even, and your food comes out with the grill marks that we prefer.The vents on the grill are also efficiently designed so excess grease drips into the tray below. The broth that collects in the tray can be used to further flavorize your food. The unit heats up enough to cook hamburgers and most foods. However, it may not get hot enough to cook thicker cuts of meat. The grill is very lightweight and portable. It weighs a light 5.5 lbs and can be carried anywhere, such as on camping in a full-powered vehicle. You can even use it at home. The cooking area is reasonably large with a 15 X 10 inch space. As long as you add water to the drip tray during grilling, you will enjoy virtually smokeless grilling. Adjustable heat setting from low to high for searing. The grill comes with a 1 year warranty. The grill is easy to set up, clean and store because of its small size. Flexible use, indoors and outdoors. Cool-touch base and safety handles. The grill is coated for non-stick use. However some users have complained about the non-stick coating on the drip tray peels quickly. May take a little longer to cook food than traditional grills. The temperature knob doesn’t have labeled temperatures. May not heat up enough to cook thicker cuts of meat. Some users may feel the lack of a lid. Overall, it’s hard to find a grill for the price of the Excelvan that actually works. This grill is well built, comes with a warranty, and is highly portable. It has a removable drip tray and is quite easy to clean. It may not heat up enough to cook thick cuts of meat, but for your everyday hamburgers, kebabs and veggies, the Excelvan grill is quite a valuable little appliance. Weber’s gas and charcoal grills are well known, but if you want to avoid the smoke and mess of propane or charcoal briquettes, then Weber’s line of electric outdoor grills is a great series to look at. The Q1400 electric grill can be a compact yet powerful addition to your outdoor barbecues. The unit is designed to be highly efficient. Even if it’s small, it can run temperatures of more than 600 degrees. You can use it to do a lot of things, including searing a steak. The unit heats up quickly and is quick to recover heat after the lid has been lifted. If you don’t want to burn your propane when you’re camping, this is the grill to buy. The cast aluminum body and lid are sturdy and rust-free. The drip tray slides conveniently under the body and can be removed easily to drain excess grease while cooking. The small grill makes very efficient use of its small space. It has an output of 1560 watt, which works out to about 8.25 watts per square inch. It is capable of reaching and holding searing temperatures. This is the advantage that customers get as a tradeoff for the small cooking surface. However the cooking area of 189 sq inches is good enough to feed a family. You can cook a pair of steaks and about four hamburger patties at the same time. The design goes a step ahead than many tabletop open grills, by adding a dome lid. This feature keeps heat in while the food cooks, and ensures even heating. Not all open top grills have this feature, so the Q1400 is a step ahead in this regard. Since temperatures reach searing levels, you can cook everything from juicy steaks to roast chicken in this little convenient grill. There are additional features to keep the heat from escaping, in the form of two aluminum heat retention liners. These liners reduce preheat time, and the grill generally heats up in ten minutes on high. The cooking plate is cast iron with porcelain enameling. This plate offers the even heating of cast iron across its surface. The porcelain enameling protects the metal from reacting with food or corroding with use. The grill is very easy to set up, since it comes assembled. The grill has been ergonomically designed. The cast iron plate and cast aluminum bodies add to the weight of the appliance. But it weighs lighter than a full cast iron grill. It is also easy to move around. The handles on the lid are large and comfortable to grip. The control knobs are also large and easy grip. Cleaning the Q1400 is easy as long as you wipe down the grill plate, remove the drip pan, and manually clean the grill bowl and cradle. Wipe down the grill with paper towels after use. The electrical element can be pulled away from the side, and the unit can be safely washed with soap and water. Some users wonder whether to line the inner liners with aluminum foil to keep the grill cleaner during use, but Weber recommends not to use aluminum foil. The grill is only 120 V, but it packs a punch in its ability to reach high output temperatures. The cooking grates are made of stainless steel. This means that your food will get the grill marks that traditional charcoal grills provide. The Q1400 is reasonably lightweight for a full-featured outdoor grill. It weighs 34 pounds, and has ergonomically designed handles. Reasonably easy to clean, as long as you follow recommendations by Weber in the manual. Some users may prefer a larger grilling area. This grill is not suitable for large groups. At a dollar under $250, the grill is by no means cheap. Overall, the Q-1400 is one of the popular series of Weber Q grills, and is one of the smaller grills in the series. All the grills in this series are built to be efficient and powerful. The Q1400 is an electric version in this line of best outdoor electric grills, and is great for use in places where you can’t take along a gas grill or a propane grill. The Q1400 manages to solve the problem of achieving a high heat output despite the 120 V limitation in electric grills. The small and efficient design of the grill and the insulated aluminum liners are the innovative features that makes this unit such a hit with campers and families. The price point can be a putoff for some people. But if you’re looking for the best outdoor electric grill and are willing to spend a few hundred dollars for, then this may be it. When it comes to Asian-style grilling of yakitori, Korean barbecue, kebabs and other thinner cuts of meat, open mesh grills are the best. Such grills are good for grilling oysters, delicate seafood, steaks that are not too thick, chicken, fish filets, chopped vegetables and other similar foods. The Livart LV-982 electric grill is a substitute for outdoor charcoal mesh grills that aren’t always the most convenient option for urban living. This electric grill also lowers the smoky fumes and odors that are released when cooking on a traditional open-style charcoal grill. The Livart grill is made in South Korea, where yakitori barbecues are common. Yakitori grilling involves cooking small pieces of food on the table while dining. The quality of South Korean manufacturing is well known. Anyone who is looking for a grill that doesn’t need to cook very quickly and produces a nice freshly grilled flavor. Let’s take a look at the features that makes this grill popular with customers, as well as the grouses they have. The grill is not just great for yakitori style cooking. You can use it to cook fish fillets as well as hamburgers and steaks that aren’t too thick. You can also use the grill as a hotplate to keep a pot on. The unit is easy to clean, if you aren’t in a hurry. Any juices and grease that drips off from the cooking mesh and touches the exposed heating element immediately evaporates. Any remaining grease and juices is caught in the drip pan. To clean the mesh cooking surface, it is best to immerse it in a pan of hot water with dish detergent. Any stubborn grease and foods stuck to the grill rack will loosen in about ten minutes. Adding water to the drip pan will also help you bring splatter down and make it easier to clean. The grill is adjustable. All you have to do to bring the food closer to the heating element is to flip the mesh over. This is recommended when you’re cooking full-size meats like hamburgers and steaks. The heating element is exposed rather than being built into the surface mesh. This design can seem like a dangerous choice. But the excess grease from foods on the grill evaporate when touching the element, which is a useful feature to prevent a mess. The grill is portable and lightweight as well. It weighs around 6 pounds and can be placed on an outdoor table on your patio in summer. It also makes an excellent addition to a trailer or an RV lifestyle. The grill has a reasonably small footprint. It measures 15.4 inches by 8.3 inches, and is about 5.4 inches high. Note that the cooking surface is about 10 7/8 inches by 7 ⅛ inches. Another advantage is the size of the mesh. The grill rack has ½ inch squares, which means the mesh gaps are small enough that pieces of food don’t fall into the heating element and drip pan. The grill gives food a hint of charred flavor and a seared crust, which makes it a great alternative to pans minus the oil needed for frying. This is possible because the grill hangs quite low close to the element in one of its positions. Stainless steel grill heats up quickly, with a powerful 1450W output. You can cook a variety of foods, including chicken, steaks, burgers, shrimps, fish fillets and chopped vegetables. You get the advantages of an open grill without the smokiness that comes with outdoor charcoal grills. You have access to the food as it grills. This gives you greater control over your cooking, especially as compared with clamshell electric grills. The grill height can be adjusted for different levels of heat. Drip tray at the bottom catches excess fats from cooking, and can be used for cooking other foods. The unit is portable and lightweight. Food can take a little while to cook, since there is no top heating element like there is in clamshell grills. However, this is only in comparison with a traditional charcoal grill, and differences in cooking time are by a couple of minute or so. Grilling is uneven. Customers will find the center of the grill that is closer to the heating element gets hotter than the edges of the surface. Overall, the Livart LV-982 is for you if you’re looking for a grill to cook Asian-style food. The grill comes with the convenience of cooking at the table. It may heat up slow but achieves good heat for thin meats and delicate seafish. At a competitive price, the unit is quite an attractive import from South Korea. As long as you use the grill for the purpose it’s designed to be used, you won’t be disappointed. There are reviews that suggest this grill takes too long to cook thick cuts of meat, and it does, because it’s not designed for such use. If you enjoy yakitori, Korean barbecue, seafood grilling, etc., then this is an excellent addition to your kitchen or camping gear. The grill forms an integral part of any barbeque. There is nothing that can beat the charm of backyard grill serving sizzling delicacies during a dinner party or a family reunion. Outdoor grills have become a popular choice when it comes to outdoor cooking. They are fast, reliable and convenient. These offer versatility in addition to other options. The cooking system forms the core of a great grill. If you are planning to purchase an outdoor electric grill, then you must not miss out on the basics. This will help you in making the right move while purchasing the best outdoor electric grill for you. Choosing the best outdoor grill is not an easy task. This is because there is a plethora of designs available fabricated from variety of materials, different kinds of burners, different materials used for grates, size of cooking areas and a lot more. Even the budget plays a crucial role in determining the model that you would opt for. This guide will help you make a perfect purchase of the best outdoor grill that would fit your cooking needs. These factors will help you with the decision-making process while making an investment in an outdoor electric grill. You need to opt for a grill with the fuel kind that’s best for you. Here are the different variants of outdoor grills based on the kind of fuel utilized by the device. By going through the description on different kinds of grills based on fuels, you will find out why electric grills add to your convenience. Although each grill has its own pros and cons, there is a reason why electric grills are desirable. These outdoor grills are known to impart smoky, rich flavor to your delicacies that can only be imparted by a charcoal flame. Lump charcoal and briquettes are lighted with a match to heat up this grill. The entire process can be quite messy if you are not fond of dealing with charcoals. This grill may prove to be expensive than gas grills and can be hard to maintain or regulate the temperature. These grills have a special infrared has burner that converts natural gas or propane into infrared radiation. This in turn offers high heat output. Installation of these grills is quite easier and these can maintain an even temperature while cooking. These grills cut down cooking and pre-heating time as well as the fuel costs. However, there are some problems that the users face while using infrared grills. There is no option for temperature regulation in lower ranges. As the intensity is quite high, these grills are suitable for crafting fish and vegetable recipes. The chances of charring food are quite high because of extremely high temperatures. These utilize pumice stone, lava rock, heat plates or ceramic briquettes for mimicking the flavor imparted by charcoal grills. These are easy to ignite. You can start crafting your favorite recipes in just ten minutes after setting up. These offer precise control over the temperature. These grills are bit expensive and refilling propane tanks is always a hassle. These don’t impart the smoky flavor to your food as charcoal grills. If you forget to turn off the control knob, then you can run out of gas in no time. The entire set up consumes a lot of space. Electric grills are quite easy to start and heat up in no time. As the name hints, these grills run on electricity. These are powered with either 220-volt or 120-colt power source outlets. The 120-volt models are portable and smaller in size. These are ideal for people with space restrictions. These do not emit tons of carbon monoxide which make these apt for usage in enclosed areas especially if you are using them in your garage or sheds. There isn’t any kind of emission in electric grills and hence are deemed to be safe for your health as well as for the Earth. These come with manual control and you have the complete power over managing the settings. This grill is safe to use and cook recipes the way you want to. These grills are easy to clean, cost effective and convenient. The best outdoor electric grill has the following features to offer convenience to the users. If an electric grill comes with a temperature gauge and a cover built into the lid, then you can be assured that it is going to simplify your tasks during your outdoor cooking stints. There are many contact grills that have an LED fitted to indicate you when you are good to go after the grill has attained a specific temperature. Each time you check on your delicacy by lifting the lid, a certain amount of heat escapes. The best outdoor electric grills need to have enough power to make up for the lost heat in no time. Although slow cooking imparts delicious flavors to your meat, the best electric grills need to heat up to temperatures greater than 600 degrees Fahrenheit in order to sear steaks and other meats appropriately. It can be a tough task when it comes to cleaning large grill plates especially if they are not removable. Removable grates or plates can simply be cleaned in a dishwasher. These can come in handy especially after long hours of your BBQ party when you just want to relax and don’t want to put up a fight with the chores. Regardless of what is being cooked, it is essential to have an electric grill that offers accurate, even and consistent temperatures. You need different temperature settings for grilling a sandwich and a different setting to sear a steak. This is the reason why you need to opt for outdoor electric grill models that come with an adjustable thermostat. This feature lets you tweak the temperature depending on the contents and the portion of the delicacy that you are grilling. This cannot be an issue for outdoor or indoor electric grills that are designed on the same lines as a conventional grill. However, in contact grills, a floating hinge can promise even cooking from both the sides. This feature is crucial especially when you want to grill sandwiches. If the lid doesn’t sit appropriately on the bread, then it can spoil your entire recipe. This is something that shouldn’t be overlooked. Electric grills are immensely beneficial when it comes to quick warmup times, easy lighting and low fuel costs when compared to other outdoor grills. However, if you cannot find the nearest electrical outlet, then there is no point in investing in an electric grill. Hence, you need to make sure that the cord length is enough so that you can work comfortably in the area of your backyard that you desire. You shouldn’t ignore the installation types as well when it comes to purchasing outdoor electric grills. The style of the grill cannot be ignored as these are designed for special installation types. You need to carefully study the location where you wish to place your grill, measure the size and study all the vital information before investing in an outdoor grill. Built-in grills are becoming immensely popular these days. There are available in different models such as stone and cement versions. You can also opt for custom enclosure based on the options offered by the manufacturers. These can become the focal point of your barbeque parties. Freestanding grills are also popular because of the ease of installation and use. These can stand-alone and possess a finished look. Many of these models come with storage spaces to hide gas tanks from the view. You can also opt for portable grills that can be moved easily. These are freestanding models with wheels attached to the legs. These run on charcoal, electricity and liquid propane. Apart from being used as outdoor grills for your backyard BBQ parties, these can be taken while on camping trips, for picnics and while tailgating. Apart from considering the specifications of an outdoor grill, you need to consider how many people you would be typically cooking for. Would it be just you and your spouse or do you wish to purchase a grill that can be put to great use while hosting BBQ parties during winters? As per the experts, 72 square inches is required per person which is the average size of a dinner plate. The number of plates that can be filled on the grill would provide you an estimate of how many people can you cater to in a single session. The bigger the grill, the more expensive it would prove out to be and more would be the cost for heating it. If you are using a grill for just a couple of times during a particular season, then it wouldn’t be best to invest in a giant grill. You can maximize indirect heart with larger surface space and more burners especially when cooking certain cuts of meats. You also need to look at the material of grates. They need to be sturdy enough to perform consistently. Grates made of porcelain-coated cast iron are believed to last for a longer time. However, there are other grate options as well such as stainless steel that can be quite durable. The additional features you need to look into an outdoor grill are directly dependent on your usage. You obviously would want grill accessories such as thermometers, cooking utensils and cleaning tools to be offered with your outdoor grill set. However, there are many designs that come with extra side burners and additional space for rotisserie. You can look into these details to grab the best deal possible. Halogen lighting can be beneficial outdoors as it illuminates the surface of the grills and makes cooking in the dark quite easier. You can also consider grills with smokers. These infuse flavor into your delicacies by employing slow cooking techniques at lower temperatures. If you want to make the entire setup quite interesting, then you can opt for rotisserie splits. These rotate food within a heated grill chamber. It is ideal for slow roasting meats for imparting an intense and juicier flavor. These consume less heat as opposed to grilling in a flame. Several models have integrated rotisserie. Make sure to look into this aspect if you are looking to up your BBQ game. Thermometers are crucial for monitoring the temperature of your grill. You don’t have to lift the lid for this purpose. Some models also come with meat probes and digital displays for convenience. Make sure to look into these details before purchasing a model for your backyard. Do not forget to check whether the grill you are considering comes with a grill cover or not. This is crucial to protect your outdoor grill from harsh weather elements and dust. If not, then you will have to make an investment in a good grill cover. Apart from accessories and other elements, the other factor that shouldn’t be neglected while purchasing an outdoor electric grill is the BTU rating. The amount of heat generated in a grill is measured in British Thermal Units [BTU]. Although these cannot measure the effectiveness of any grill, these help you understand the power consumption of your grill and the time it would take to heat up completely. If you are planning to transform your patio or deck into an entertainment mecca for your friends and family, then adding a BBQ certainly makes sense. Outdoor kitchens are incomplete without a grill. You can opt for steel grills that feature a base cabinet. Based on how you wish to use your outdoor area, you can identify the appliances and the accessories that you would require. These days, grills are being designed to offer maximum comfort and convenience to the users. Imagine if you had everything at your fingertips and would not have to run back into your kitchen now and then while hosting a BBQ party. There are several outdoor electric grills that come with steel cabinets and drawers for storage space. These offer you the necessary countertop space that you are looking for. You can safely tuck in dishes, pans, pots, brushes, a thermometer and other accessories within these cabinets. This is an excellent cost saving option for families looking for added convenience. You can opt for these or for an electric grill model that comes with this feature. Apart from drawers and cabinets, several grills come with deluxe options such as marinating drawers, adjustable shelves, warming drawers, a refrigerator unit and a lot more. If you are willing to make a decent investment and get the best possible features in an electric grill, then you can opt for outdoor bar units that come along with the grills. You can have this feature customized so that you can serve your guests cool drinks after a hot summer day. These units let you store towels, ice, bottle boots and a lot more. It is entirely up to you to decide the features that you find desirable within your budget. Outdoor electric grills are becoming increasingly popular because of the convenience that they offer. Make sure to study all the features in order to take an informed decision. So, that’s it from this article. You can choose any of these top 5 best outdoor grills after carefully reading buyer’s guide as well pros & cons given in top outdoor electric grill reviews, overall it will be easy for you to choose the right product after reading this article, so all the best for shopping. Cheers.